Within Lightroom Classic CC, Craft users can now access up to 11 tools by tapping the keyboard's crown, among them contrast, saturation, and shadows. A single tap switches functions, while turning the dial makes the actual adjustment. In Safari the crown can be used to switch tabs, while in Preview it can zoom, scroll horizontally, or change pages. QuickTime lets people alternately scrub forward and backward, or adjust volume. In Spotify the crown handles play/pause, volume, and changing tracks. Logitech has also finally released its promised Software Developer Kit, allowing developers to create their own plugins. AppleInsider examined the keyboard in October 2017. At the time, limited software compatibility was its biggest drawback, but with Wednesday's additions, that looks to improve going forward. 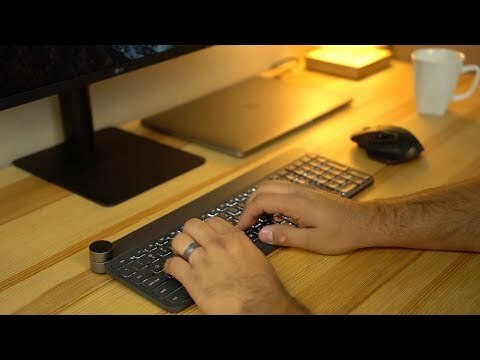 The Craft Advanced Keyboard costs $199.99. If I have to move my hand from the keyboard to something else like the dial, why would I not just move my hand to the mouse. I can then proceed to do what ever I want vs a limited set of functions that I have to learn. These types of products are solutions to things no one has a problem with. Give me a split version and you have a sale. And you can move a mouse to the other side of the keyboard.